Tennessee Williams’ has always been a playwright that I find easier to admire than to enjoy. His heady blend of American naturalism and fevered southern gothic melodrama sounds such an appealing combination that it is hard to pin down why I find his work such a struggle. Yet time after time after time, be it Baby Doll, Night of the Iguana, Suddenly, Last Summer, Sweet Bird of Youth and, yes, even you, Streetcar (with or without Brando) guaranteed I will find my brain slowly turning to molasses as sure as if I was right there in the evening heat of the Mississippi Delta. However the Canal Café Theatre’s production of The Fat Man’s Wife, previously unstaged in the UK and never seen anywhere before 2004, perhaps provides a clue to my troubles; length. Many of Williams’ plays are just too long. The Fat Man’s Wife, although far from a classic, comes in at a trim fifty-five minutes and could be nearer fifty if some of the pauses in this generally solid production were not quite so pregnant. The shorter running time see Williams present something more akin to a light mood piece than the cloying richness of his more baroque work, whilst the metropolitan setting with its urbane characters means everything stays just about the north side of the Mason-Dixon line and avoids falling into Williams’ favourite Southern state: grotesque. The sense of Williams’ work being closer to an examination of mood than a fully developed play suits an evening that is not dissimilar to seeing a seasoned jazz trio perform some improvisations on a Sunday afternoon; you realise that whilst the surface of The Fat Man’s Wife is fresh and new, underneath there is the emergence of motifs that will repeat again and again through his work or an idea will spark and you can see how later it will be bent and refracted in a new way to power a later, more mature drama. This recycling of themes and ideas in later works is hardly something limited to Williams but rarely can it be seen so clearly. There is the older female character flirting with the idea of a relationship with a younger man, the fear of age and growing old alone is present, the gap between the optimism of youth and the realism of age and the tear between the grim truth of reality and unobtainable fantasy; these are all ideas that even at this early stage Williams was clearly playing around with and would later return to and develop into his best known work. The Fat Man’s Wife is supported by a cast who work exceptionally hard in a very limited space. The action takes place with audience on both sides and at times it can be a squeeze to frame the drama. On occasion these unfortunate limitations do overcome the production with a criticism being that the odd meaningful glance (and Williams does love a meaningful glance) is rather lost to half the audience, as we find we must intuit something meaningful from the back of an actor’s head. However, led by Emma Taylor as Vera Cartwright, the cast perform with spirit and capture the essence of their characters. Taylor conveys something of the glassiness of Kristen Scott Thomas in her performance, a brittleness that hinted at person whose intellect means they must bear the realisation of their hopelessness of their situation in live and a sad understanding of the futility of misplaced hope. Richard Stephenson Winter as her husband, Joe Cartwright, could easily have fallen into the trap of a one-note performance but has an impressive depth in performance. A large presence, he also brings a physicality that gives the impression of a man shrinking before our eyes and one can sense that behind the burly cocksure attitude was someone who knew quite well how other people saw him. 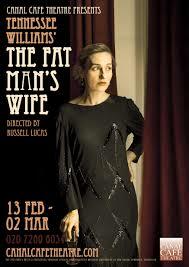 So there is a lot to recommend in The Fat Man’s Wife; for Tennessee Williams devotees it is essential viewing and for those who want a taste of the man without risking indigestion it works as an interesting amuse-bouche. The Canal Café Theatre have pulled off quite a coup in securing the premiere of a work by one of the 20th century’s major playwrights (even one in a minor key) and it would be churlish not to wish them luck for the rest of the run.